Saab convertibles have been objects of automotive desire for nearly twenty years, and so Saab is at the forefront of the compact luxury convertible class. When the latest version of the 9-3 sedan, introduced a year ago, was being designed, a convertible version was planned from the beginning and developed in parallel. There are some rather significant differences between the new Saab convertible and its sedan sibling. Obvious, of course, is the convertible top. But note that while earlier Saab convertibles were developed from two-door hatchbacks, that body style is gone from the current lineup. This one comes from the sedan, but its unibody structure has been modified considerably for convertible use. Reinforcements, called by Saab the ``ring of steel'' tie the front, rear, and side structures of the convertible's chassis together to make it nearly as stiff as that of the sedan. 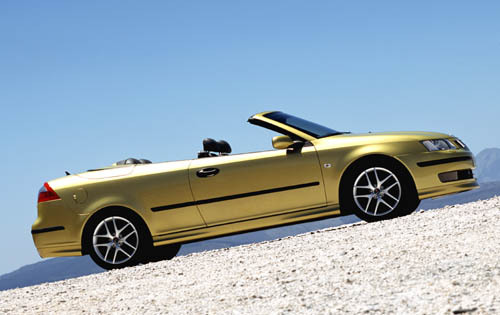 It's nearly three times rigid than the previous Saab convertible, for improved handling, comfort, and safety. The 2004 9-3 convertible is offered in ``Arc'' and ``Aero'' trim, Arc being Saab's mid-level, sport-touring specification and Aero being the all-out performance version. As with the sedans in the same trim, they share an engine - the 210-horsepower high-boost 2.0-liter turbo four - but the Aero has a more aggressively sport- tuned suspension and is available with a six, not five-speed manual transmission. Both can be had with the five-speed ``Sentronic'' automatic, which has a manual shift mode. I recently spent a hot summer week with an Arc convertible outfitted with the automatic. ``Pleasant'' would be gross understatement in describing the car. With its fast-acting, completely automatic and very well-insulated top and excellent (``instant Sweden'' was the phrase that came to mind) air conditioning, comfort was complete. The softer Arc specification and automatic worked in the car's favor, as the convertible is, by its open-air nature, more suited to a relaxing cruise than sports driving. Top-up for triple-digit afternoons or in the cooler evenings, the 9-3 convertible was always a joy. It should be just as comfortable come winter, and the Swedes know winter. This is a real four-season car, not merely a toy for a spring afternoon. APPEARANCE: While the 9-3 sedan and convertible share styling in front of the windshield, the rearward sheetmetal is noticeably different. There are only two doors, and while the sides are otherwise much like those of the sedan, the body shape is much more like that of the previous-generation 9-3 convertible. The rear panel is more rounded than that of the sedan, and is tucked in at the top like the earlier convertible. The convertible's taillights are more triangular in shape than the sedan's, and follow the contours of the rear panel. With the top up, the 9-3 convertible is not as sleek as the sedan, but drop the top and it's perfect, with a sporty low-nose, high-rear wedge-shaped stance. Rear-seat headrest fairings in the metal tonneau add to the sporty impression. COMFORT: Convertibles are great in warm weather, but when it gets over 100 it's time to put the top up. In the new Saab convertible, this means pressing a button on the dash for about 20 seconds - no manual latching necessary. When time comes to take it down again, just hold the button and watch the amazing mechanical (and hydraulic and electric) trickery at work. While the convertible's interior is similar to the sedan's, with a semi-wraparound cockpit- style instrument panel, it has unique and very comfortable front seats, with the shoulder straps anchored to the seat frame to ease rear-seat access. There is room for two medium-sized adults in the rear. Interior storage is excellent, with a huge locking glovebox augmented by both open and covered console storage. If the high, short rear deck gives an impression of small trunk capacity, that is an illusion. There is no need to travel light in the Saab 9-3 convertible. SAFETY: The windshield frame, front and rear crossmembers, enlarged side sills, lower B-pillars, and door beams act as a strong central structure to protect the 9-3 convertible's passenger compartment. The ``Dyna Cage'' system's pop-up roll bars, seatbelt pretensioners, and reinforced windshield frame give protection in the event of a rollover. Saab's active head restraints, adaptive front air bags, and two-stage side air bags also protect occupants. ROADABILITY: Cut a hole in the top of a modern unibody car without careful design and engineering, and disaster will result. Try it yourself with a shoebox. Twist the ends with the top on, and then with the top removed. The top of the box, or a car, adds considerably to its rigidity. Some of the earlier Saab convertibles weren't exactly noted for their rigidity, but lessons have been learned, and learned well. Because of the significant reinforcement around the passenger area, the new 9-3 convertible has one of the most rigid structures in its class. I only noticed cowl shake on a section of secondary road that is not exactly a good advertisement for the county maintenance department. And even then, it was very minimal. The result is handling that is equal to that of the 9-3 sport sedan, and a notable lack of the creaks and rattles that are all too common in convertibles. My test car, being an Arc, had its fully- independent suspension tuned more softly than that of the Aero, but that calibration works very well for the more relaxed, fun-in-the-sun convertible experience. Call it sport-touring, Swedish style. PERFORMANCE: Both versions of the 9-3 convertible use the high-pressure version of Saab's 2.0-liter turbocharged and intercooled four-cylinder engine. A twincam, 16-valve alloy design, it makes 210 horsepower at 5500 rpm. High specific output engines can be peaky, but not this one. Maximum torque is 221 lb-ft at a low 2500 rpm, with most of that available between 2000 and 4000 rpm. This means effortless acceleration, whether with the standard five- speed manual transmission or the optional ``Sentronic'' automatic with manual-shift mode. My test car had the automatic, and it was perfect for the car's character. With 300 lbs. or so more weight than the sedan because of the structural reinforcements, the convertible is not as quick in acceleration. So what? Relax, put the top down, and enjoy the sunshine. CONCLUSIONS: No compromises between pleasure, practicality, or seasonal function are necessary with the new 2004 Saab 9-3 convertible. Wheelbase / Length 105.3 in. / 182.5 in.